With special thanks to Leslie Myrick of the Mark Twain Project at Berkeley for her work on recovering information on "Hy Slocum" from historical newspaper archives. "Mr. 'Hi. Slocum' is the habitual plagiarist who did it." Frank Manly Thorn was an attorney and resident of Orchard Park near East Hamburg in Erie County New York. He was a frequent contributor to the Buffalo Express newspaper using the pen name "Hy Slocum" when Samuel Clemens was part owner of the paper. After a controversy over plagiarism involving an article signed by "Carl Byng," Clemens removed both "Slocum" and "Byng" from the list of acceptable Express contributors. After the controversy, Thorn changed his pen name to "Frank Clive" and contributed to the rival newspaper Buffalo Courier. His later career was spent as an official in President Grover Cleveland's administration. In August 1869 Samuel Clemens acquired a one-third interest in the daily newspaper Buffalo (NY) Express. He had just completed his first major work The Innocents Abroad and was enjoying a growing national reputation as a humorist. For over a year previous to Clemens's assuming ownership of the newspaper, the Express had printed articles and sketches in a humorous vein signed by "Hy Slocum." The first article in the Express over this pseudonym appeared March 31, 1868 titled "Hy Slocum's Views" and focused on the presidential campaign of 1868. Slocum's contributions became more frequent after Clemens assumed a managing role at the Express. For decades scholars debated whether or not Clemens was writing these contributions himself under the Hy Slocum pseudonym. However, most scholars concluded that the writing was that of an unidentified American humorist. The name "Hy Slocum" disappeared from the pages of the Buffalo Express after the publication of a final item on October 2, 1870. However, on November 12, 1870 a new contributor surfaced with the pseudonym of "Carl Byng." On December 3, 1870 "Carl Byng" contributed to the Express the story "Three Aces: Jim Todd's Episode in Social Euchre." A few weeks later on January 7, 1871 the literary magazine Every Saturday, edited by Thomas Bailey Aldrich, accused Mark Twain of writing "Three Aces" and further described it as a "feeble echo of Bret Harte." Clemens wrote to his colleague Charles Henry Webb on January 14, 1871 describing the accusation as a "pretty grave charge. Mr. "Hi Slocum" is the habitual plagiarist who did it." Clemens also wrote Aldrich on January 15, 1871 asking for a retraction and stated the article was "the work of a writer who has for years signed himself "Hi. Slocum." A few days later, Clemens again wrote Aldrich on January 22, 1871 asking him to state that it was "Carl Byng" who had written "Three Aces." Clemens's second letter to Aldrich indicates that he was confusing the names Slocum and Byng and some scholars have debated whether the confusion was feigned in order to protect his own Byng pseudonym by sacrificing Slocum's. Clemens concluded his letter, "I have just crossed Mr. Carl Byng & Mr. Hy. Slocum both off the "Express's" list of contributors (for their own good -- for everything they write is straightway saddled onto me.)" Clemens was correct. Other newspapers across the country had reprinted both Byng's and Slocum's contributions and assigned them to Mark Twain. Slocum's article "Yaller Dogs: An Allusion to Them" from the Buffalo Express on November 20, 1869 had been retitled "Mark Twain on Yaller Dogs" in the San Francisco Golden City of December 19, 1869. Byng's "Agricultural Twaddle at the Institute Farmer's Club" published in the Express on November 12 was reprinted in the Pittsburgh Gazette on December 7 as "A Humorous View of the Farmers' Club. Mark Twain's Report of the Proceedings." No further articles signed "Hy Slocum" or "Carl Byng" appeared in the Express after the Byng controversy over "Three Aces." For well over a century, the identities of "Hy Slocum" and "Carl Byng" have been open to speculation. Were they pseudonyms of one unknown humorist or two? With the growing proliferation of searchable historical newspaper databases, researchers have now been able to establish the identity of the writer who signed his work "Hy Slocum" as Frank Manly Thorn. A short notice about Frank M. Thorn in Buffalo Courier, Feb 9, 1876 provides the key to the "Hy Slocum" puzzle. Historical newspaper databases online at the Fulton History website, have provided answers to "Hy Slocum's" identity. Frank Manly Thorn was born December 1836 in the town of Collins in Erie County New York. He was the son of Abram Thorn and Phila M. Pratt, both natives of New York. Abram Thorn was a lawyer who practiced throughout Erie County New York and served several terms as justice of the peace. In 1854 Abram was elected Surrogate of Erie County by the Democratic party. His son Frank attended local schools and later enrolled in the Fredonia Academy. From 1858 to 1860 Frank Thorn served as clerk of the Erie County Surrogate's Court and afterward attended law school at Albany, New York. He was admitted to the bar for practicing law in all the courts in the state of New York. Shortly after gaining his license to practice law, he relocated to Pennsylvania and for seven years worked in the petroleum industry there. In 1867 Thorn returned to Erie County and made his home in East Hamburg where he established a fruit farm and developed his skills in writing sketches and poetry and performing as a humorous lecturer. In the 1870 census for East Hamburg in Erie County Frank Thorn is listed as a lawyer with wife Eola and a two-year-old daughter Gertrude. The value of his real estate is listed at $20,000 -- an equivalent of over $300,000 in year 2009. For several years in the 1870s Thorn contributed essays and sketches to the Buffalo Express under the pen name "Hy Slocum." After Sam Clemens banned both "Hy Slocum" and "Carl Byng" from the Express, Thorn contributed to the rival newspaper Buffalo Courier under the pseudonym "Frank Clive." The popularity of Mr. Frank Thorn -- "Frank Clive" -- as a speaker and writer naturally awakened expectation in the minds of those who anticipated his lecture, which anything short of genuine excellence would disappoint. Yet it is safe to say that of the many who thronged Academy Hall last evening, not one went away without feeling that his expectations had been more than realized. Mr. Thorn's subject, "The Gentleman from New Zealand," gave broad grounds for conjecture as to its probable treatment. The audience were soon assured, however, that there was more domestic than foreign history in store, and that for the next hour and a half, at least, tight-fitting clothes would not prove a comfort. After an eloquent introduction, wherein the meditations of those who shall succeed us centuries hence, as they study our history through our ruined handiworks, were beautifully pictured, he proceeded to discuss with keenest logic and more than Mark Twain wit, the absurdities of our social, moral and political practices. This he ingeniously embodied in the form of a report made by a New Zealand Envoy on his return from this country to his majesty the King of New Zealand, which the poor susception-worn savage is very aptly made to conclude "be thankful, O ye King, that we are barbarians!" Any attempt at a short synopsis of the lecture would prove an injustice to the lecturer. A compound of eloquence and wit, well supported with persuasive logic. Now you were led by the beckonings of flowery words and rich laden sentences, until you were giddy with admiration; now thrown into convulsions of laughter by some interposition of sharpest wit, all, a seasoning interwoven, at once emphatic and undisputable. Pre-eminently a versatile production, the lecture should be heard to be appreciated; written in Mr. "Clive's" well-known style, it will class among his most brilliant achievements in the literary field. After obtaining publication in the prestigious Scribner's Monthly in November 1875 with a poem first published April 18, 1871 in the Buffalo Courier titled "'Words and Their Uses' By a Mystified Quaker," Thorn appears to have dropped his pen names and started signing his newspaper contributions with his real name Frank M. Thorn. Between 1870 and 1880 Thorn was a member of the Erie County Board of Supervisors. The 1880 census for East Hamburg lists Thorn's occupation as a farmer and his family had grown to include three sons -- Frank Bret, Channing, and Ralph. Thorn became increasingly involved in Democratic politics. In the gubernatorial election of 1882 he campaigned for his local hometown fellow attorney Grover Cleveland. 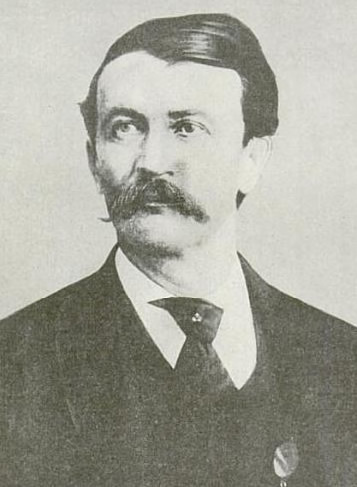 Cleveland had served as both sheriff and mayor of Buffalo, New York. Cleveland was elected governor of New York in 1882 and two years later launched a run for the office of U. S. President. In the Presidential campaign of 1884, Thorn was a strong advocate for the Cleveland ticket. After Cleveland's election as President of the United States, Thorn was given a political appointment as chief clerk of the Internal Revenue Bureau in July 1885. Shortly thereafter he was made chairman of the Treasury Committee to investigate corruption in the United States Coast and Geodetic Survey. "Hy Slocum" had, in effect, gone from being an obscure humorist banned by Mark Twain to a member of President Grover Cleveland's inner circle. The United States Coast and Geodetic Survey was the federal agency in charge of mapping and charting the United States coastline and developing a number of scientific applications which would provide a foundation for communication and transportation. Today the agency is a part of the National Oceanic and Atmospheric Administration (NOAA) within the United States Department of Commerce. During the nineteenth century the Survey received federal funds for research and developed work in such diverse fields as astronomy, cartography, meteorology, geology, navigation, oceanography, and topography. Prominent among the scientists who led the agency was Benjamin Peirce, often recognized as one of America's first important scientific researchers. His son Charles Sanders Peirce, also a gifted mathematician and researcher, was employed at the agency before and during Thorn's tenure. At the time of Thorn's appointment, the Survey had been administered by scientists who were not prone to abiding by bureaucratic rules and regulations and red tape. Frank M. Thorn was the first non-scientist appointed superintendent of the agency and his job was to reform the lax financial practices that had come to permeate the organization. He pushed men such as Charles Peirce to publish their research in a timely manner. Thorn served in his official capacity from September 1, 1885 to June 30, 1889 until the close of the first Cleveland administration. A government report published years later described Thorn as "a man of sterling integrity ... he learned much about the methods and requirements of such a service as the Coast and Geodetic Survey of which in the beginning he had been totally ignorant" (Centennial Celebration of the United States Coast and Geodetic Survey, p. 139). While Thorn has historically been characterized as a man of business and not of science while serving in Cleveland's administration, evidence indicates he retained a love of farming in addition to his love for politics and literature. Thorn filed for a patent for a piece of farm machinery known as a potato digger on October 12, 1886 and the patent was granted on July 5, 1887. On November 18 1889 he filed for a patent for an improvement on the potato digger and this was also granted on September 30, 1890. After his service in Cleveland's first administration ended, Frank Thorn returned to his home in Orchard Park. His name appears frequently in the local newspapers of the area as a political activist and banquet speaker. Thorn died April 14, 1907 at his home in Orchard Park after a lengthy illness from progressive muscular atrophy. His last newspaper work was as a writer of signed editorials for the Buffalo Times He was buried in Friends' Cemetery in Orchard Park, Erie County. Photos of his headstone and the grave markers of other members of his family are available online at findagrave.com. Was Frank M. Thorn "Carl Byng" ? While historical newspapers have identified Frank M. Thorn as the writer who signed his work "Hy Slocum" and "Frank Clive," the identify of "Carl Byng" remains unknown. One of Byng's first contributions to the Buffalo Express "Three Aces" was a spinoff of Bret Harte's work. Frank M. Thorn named his oldest son Bret, perhaps as a tribute to his favorite writer. Mark Twain denied ever signing his own work with the "Carl Byng" pseudonym. Until further evidence surfaces, Frank Manly Thorn should be considered as the possible author of the "Carl Byng" contributions in the Buffalo Express. The following bibliography was compiled by Leslie Myrick of the Mark Twain Papers at University of California at Berkeley. "Words and Their Uses," Buffalo Courier & Republic 18 April 1871, 2. Reprinted in Scribner's Monthly, November 1875, 142. "Faith Justified." Buffalo Courier & Republic, 3 May 1871, 2. "What is Happiness?" Buffalo Courier & Republic, 10 June 1871, 2. "Hannah's Reply to the Mystified Quaker," Buffalo Courier & Republic, 21 July, 1871. "Isaac as a Reformer," Buffalo Courier & Republic, 2 March 1872, 2. "Isaac Investigated," Lowell Daily Observer, 27 March 1872, reprinting the Courier. "The Plague of Locusts," Buffalo Courier & Republic, 6 April 1872, 2. Reprinted in Saturday Evening Post, 18 May 1872. "The Philanthropist," Buffalo Courier & Republic, 25 May 1872, 2. "Precept Upon Precept," Buffalo Courier & Republic, 18 May 1873, 2. "Go West," Buffalo Courier & Republic, 24 May 1873, 2. "Pathology," Buffalo Courier & Republic, 28 June 1873, 2. "How to Do Up Fine Shirts," Buffalo Courier & Republic, 2 August 1873. "A Hoosier 'Habitual' on the Crusade," Buffalo Courier & Republic, 11 April 1874, 2. "The Advertisement Answered," Scribner's Monthly 11 (February 1876), 598. Probably a reprint. "The Blacksmith's Story," Gus Williams' Fireside Recitations, New York: Dewitt, 1881, 86-88. Probably a reprint. Original not yet found. "Abram Thorn," The Buffalo Express, 1 April 1899. Brent, Joseph, Charles Sanders Peirce: A Life, (Indiana University Press, 1993). Centennial Celebration of the United States Coast and Geodetic Survey, (Washington: Government Printing Office, 1916). Fischer, Victor and Michael B. Frank, eds., Mark Twain's Letters, Vol. 4, 1870-1871, (University of California Press, 1995). "Frank Clive at Academy Hall," Buffalo Courier and Republic, 3 March 1875, [p. 2]. "Frank M. Thorn," Buffalo Express, 1 August 1886, p. 2. "Frank M. Thorn Dead," Brooklyn Daily Eagle, 15 April 1907, p. 3. "Frank M. Thorn Laid to Rest, " The Buffalo Express, 19 April 1907. Mark Twain Project. Online database of letters (http://www.marktwainproject.org). McCullough, Joseph B., "Mark Twain and the Hy Slocum - Carl Byng Controversy," American Literature, vol. 3, No. 1. (March 1971), pp. 42-59. McCullough, Joseph B. and Janice McIntire-Strasburg, eds. Mark Twain at the Buffalo Express, (Northern Illinois University Press, 1999). Peirce, Charles S., The Writings of Charles S. Peirce: A Chronological Edition, (Peirce Edition Project, 2000). Online at google books. "Vicinity Correspondence," Buffalo Courier, 9 February 1876, [p. 2].